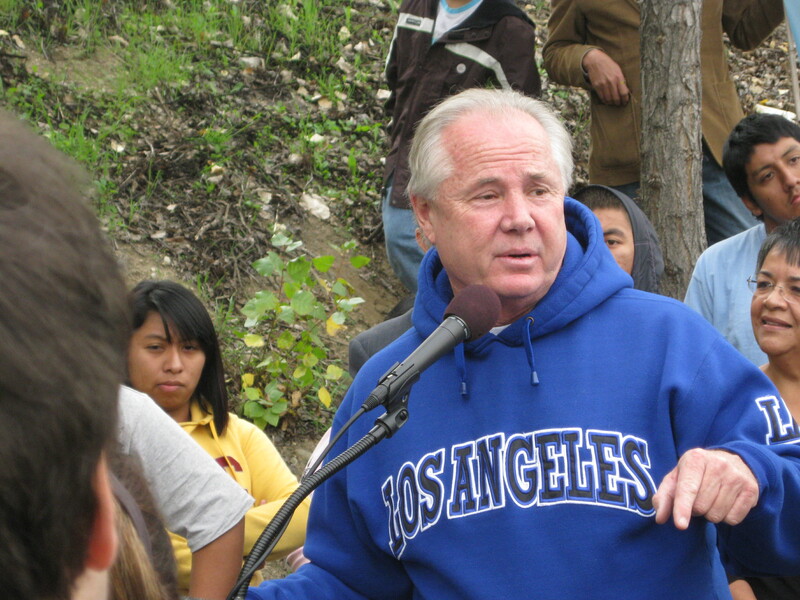 Councilman Tom LaBonge makes a point at Saturday's event. Anybody out there ready for the odd bit of good news? We all should be, what with the continuing recession/depression, unemployment that won’t go down, unending Afghanistan… And it is getting closer to Christmas. So, from the thank-goodness-for-small-favors-and-the-occasional-infusion-of-political-will department came a ribbon cutting Saturday along the banks of the Los Angeles River: the eight-mile stretch of freshly paved and dutifully yellow-lined Elysian Valley asphalt is now officially open for rubber, both tire tread and Nike sole. It’s always hard to get an accurate crowd count, and the cops left before we could ask them (peace has its advantages), but approximately 200 people listened — and cheered — as Los Angeles councilmembers Eric Garcetti, Tom LaBonge, and Lupe Vella, representing councilman Ed Reyes, talked up the accomplishment under Saturday’s threatening early afternoon skies. 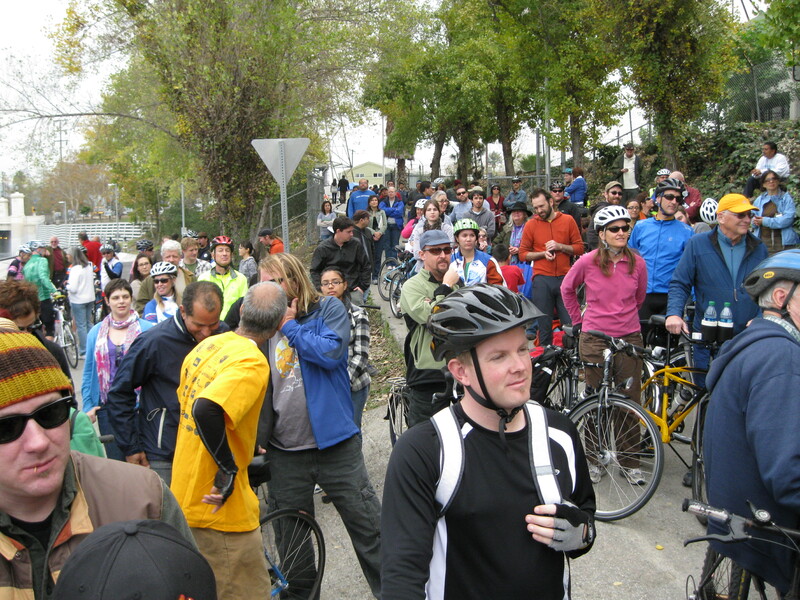 Well over one hundred people attended the opening of the Elysian Park extension of the river bikeway and pedestrian path. “The dream moves a step closer to reality,” Garcetti said, referring to eventually creating a bike path that will run the entire 51 miles of the river, from the Sepulveda Basin in the San Fernando Valley to Long Beach. Flanked by the L.A. River Keepers, teens who advise those along the river not to trash it and pick it up when ne’er do wells do, it was a day in which public and private cooperation inspired even the most cynical. Flyfishers should be happy because the new access and traffic cuts the threat of meeting people you really don’t want to meet while carping under the 2 freeway. In the past, this area had a bad rep. 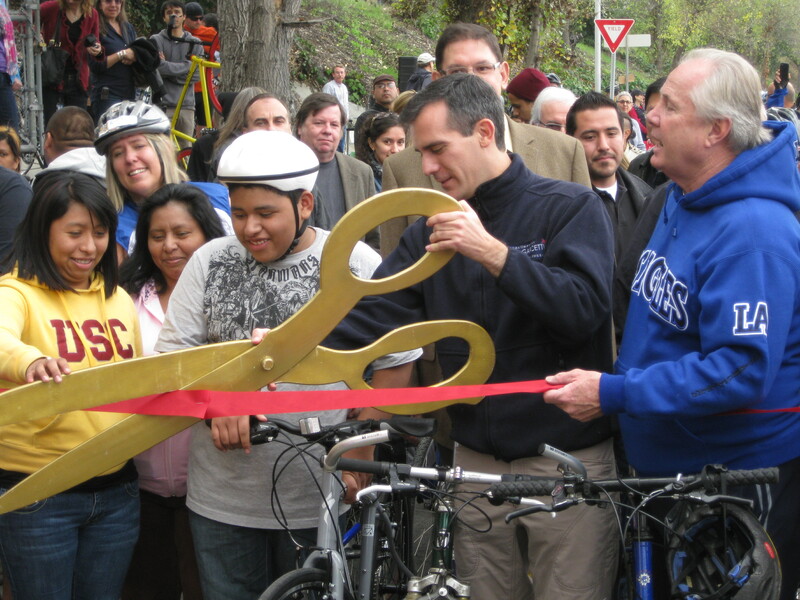 Finally, a young man named Jesus rode his new, donated bike alongside Garcetti and LaBonge, southward toward the future. The only thing missing was a donated fly rod for Jesus to strap onto his shiny silver ride. ← KCET Story Share is tomorrow!